A Carmelite monastery and church on the west top side of the Carmel. The structure was rebuilt in the 19th C, and is one of the most popular sites in Haifa. 1 Kings 18:42: "...And Elijah went up to the top of Carmel; "
The Carmelites are a Catholic order of monks, one of the oldest in the Holy Land, and named after Mount Carmel. Their primary saint is the Prophet Elijah. They established the Monastery in the 17th C. It served as a hospital for the French soldiers, who were butchered here following Napoleon's retreat in 1799. The structure was rebuilt in the mid 19th C, and today its church is a popular tourist and pilgrimage site. 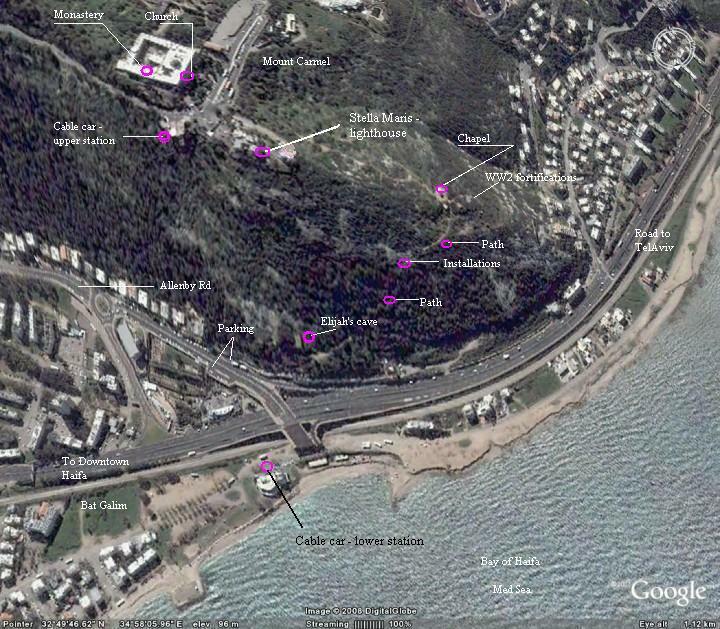 The following aerial view shows the location of the Monastery and the area of Stella Maris. You can point on the purple points to navigate to the selected point - in this we page and other pages. A Roman/Byzantine site existed at this area, and some findings of that era are displayed in a room on the entrance to the church. The Carmelites are a Catholic order of monks, one of the oldest in the Holy Land, and named after Mount Carmel. 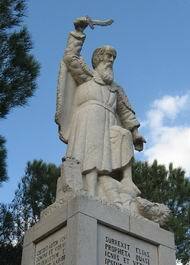 The primary Carmelite saint is the Prophet Elijah. The Carmelite monk dresses in brown and walks with biblical sandals. Their order was founded on Mount Carmel more than 800 years ago, starting from a number of Crusaders who went to seclusion in the caves on mount Carmel, and were inspired by the simple way of life of the prophet. These hermits were lead by the Frenchman Berthold (died 1188). In about 1200 their first church (St. Brocardus) was built in a brook located on the western slopes of mount Carmel. That brook is named e-Siah, now named Nahal Siakh in Hebrew, meaning bush. After the Arabs defeated the Crusaders, they were butchered and their church was destroyed. The survivors later emigrated to Europe and did not return until the 17th C.
During the mid 17th C the Carmelite hermits returned to reside in the caves below Stella Maris. The head of the Carmelite community was a Spanish monk by the name of Prosper, which arrived here in 1631 and established a makeshift monastery in the western foothills below Stella Maris. During the 1799 campaign of the French forces, headed by General Napoleon, the sick French soldiers stayed in the monastery, which became an army hospital. After they failed on their siege of Acre, Napoleon retreated , leaving his 200 wounded soldiers in the hospital. They were butchered by the Ottomans, and the monastery was demolished. 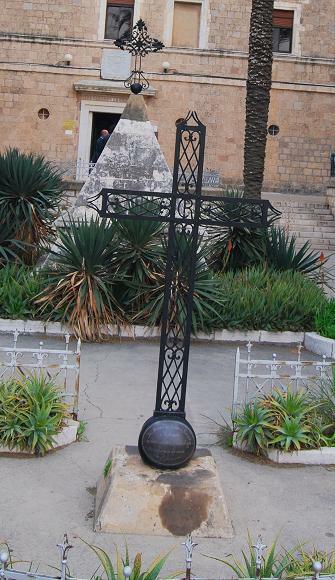 A monument was erected later in the western entrance to the Monastery to commemorate the French soldiers. 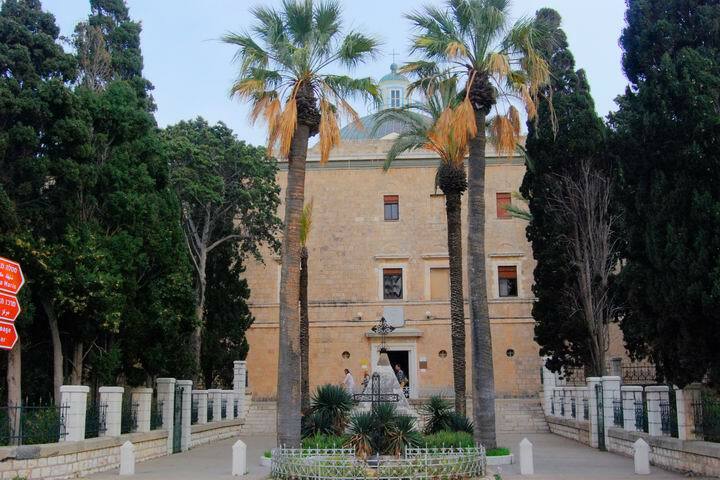 In 1821 the stones from the ruins of the Monastery, and the earlier Crusader structure, were used by the Ottoman governor of Acre to build a summer palace across the street. A light house was later added to signal the edge of the Carmel to the ships in the bay of Haifa, giving its name to the area (Stella Maris - the "star of the sea"). The Carmelites reestablished the Stella Maris monastery in the beginning of the 19th C. They laid a cornerstone in 1827, and completed the fort-like monastery in 1836. 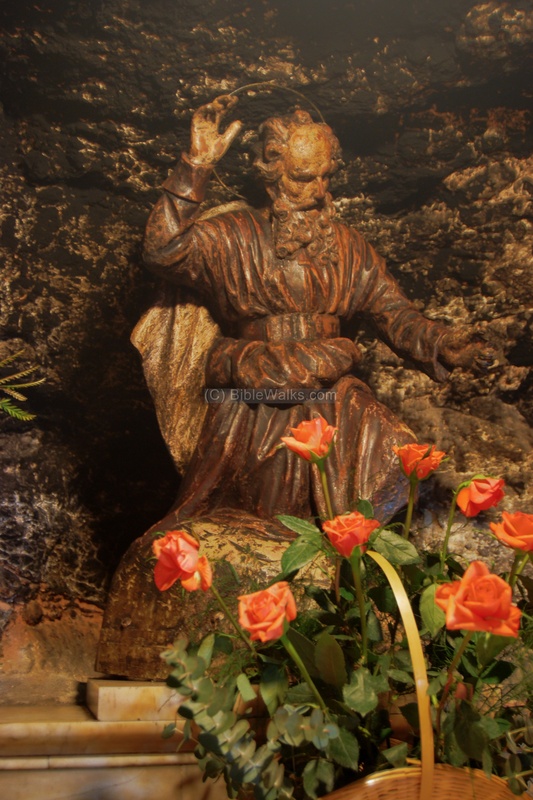 The Carmelites, whose primary saint was Elijah, hold a tradition that the cave inside the church was one of the caves where the prophet hid and stayed. The compound included Monasteries for Men, Women, a Church and a hostel. The Carmelites dedicated the Monastery to Mary, mother of Jesus, since according to tradition the Holy Family stayed in the cave on their way back from Egypt. Her statue holding infant Jesus stands above the altar. This monastery became an influential institution in the newly founded city. It gave a push to the area, bring more Christian population to the city. The Carmelite's modern center is based in Rome, and is widespread worldwide. 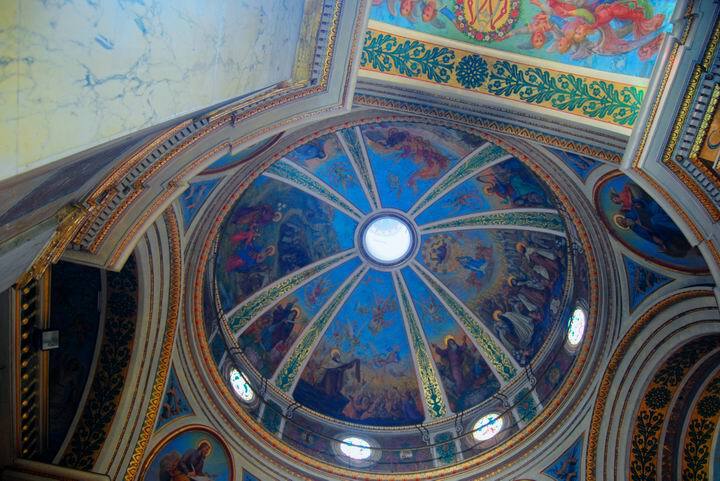 Today the monastery in Stella Maris and its church are a popular visiting place for tourists and pilgrims. It is adjacent to the vista point that overlooks on the bay of Haifa, at the upper station of Haifa cable car. The photo below shows the western side of the Monastery, which faces the sea. Between the palm trees are two monuments - in memory of the 1799 slaughter and the Acre campaign. Behind them, after a number of steps, is the entrance to the church. The western side of the monastery, with the entrance to the church. The rectangular structure is three stories high, 60M by 36M, and was completed in 1836. 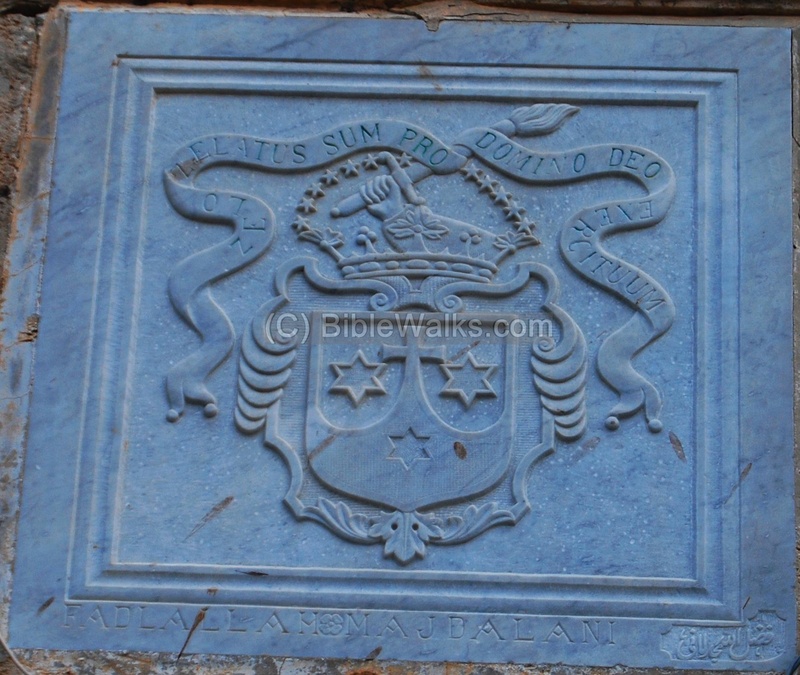 Above the entrance is the seal of the Carmelites. On the top side of the symbol is a sword that is held by the arm of Elijah, stretching out from a crown, and a Latin Biblical text (1 Kings 19:10): "...I have been very jealous for the LORD God of hosts". The floor before the church is seen in the photo below: "Ave Maris Stella". 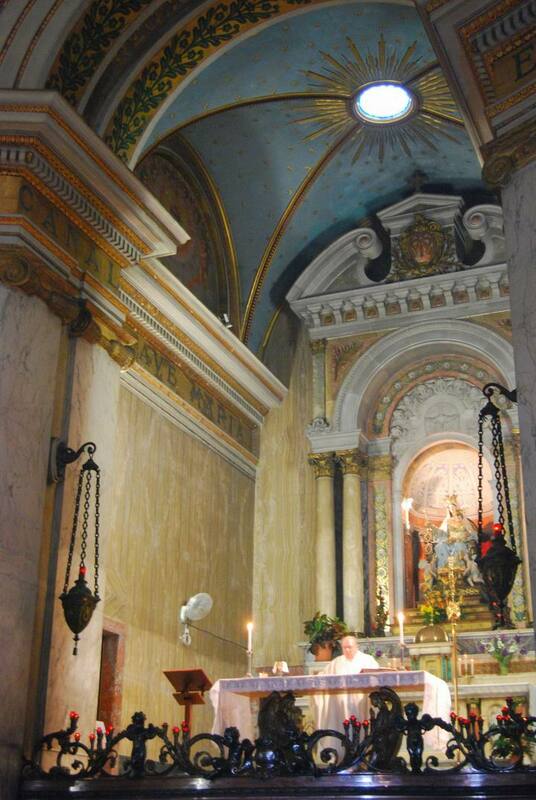 The raised altar on the east side is seen in the photo below, with the statue of Saint Mary holding infant Jesus. Around the hall are two verses from the Bible (Song of Solomon 7:5: "Thine head upon thee is like Carmel"; Isaiah 35:2: "the Excellency of Carmel and Sharon, they shall see the glory of the LORD, and the Excellency of our God"). The panel on the north side is surrounded by a marble frame flanked by reddish columns. 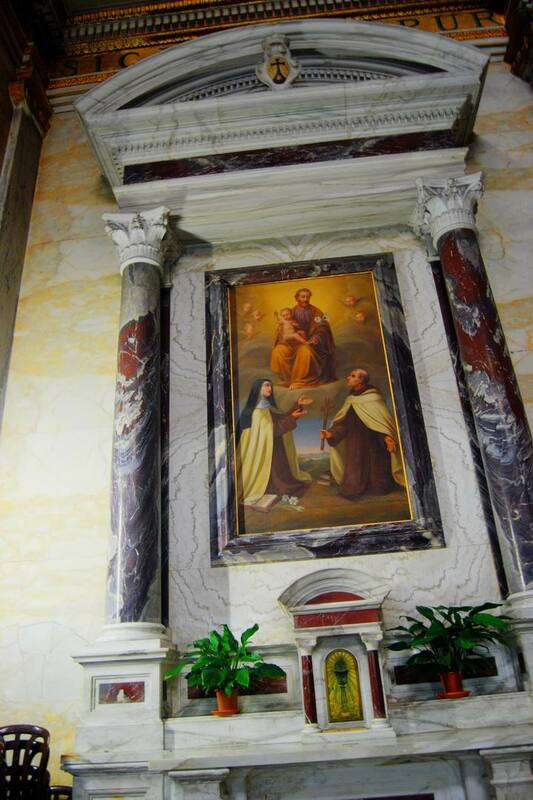 St. Teresa and St. John of the Cross, wearing Discalced Carmelite habits, gaze toward heaven where St. Joseph sits with the baby Jesus. [Thanks to Carole Slade for this addition]. St. Teresa and St. John of the Cross were founders of the Discalced Carmelite order (O.C.D) in the 16th century. The order first founded a small monastery in the 17th century near the modern lighthouse, then moved to the current location in the 18th century. After it was destroyed in 1821, they were allowed to rebuild the present monastery in the 1836. The ceiling is beautifully decorated with scenes of Elijah lifting up to heaven on a chariot of fire and horses, David playing on a harp, prophets Daniel, Ezekiel and Isaiah, the Holy family and the founders of the Carmelite order. 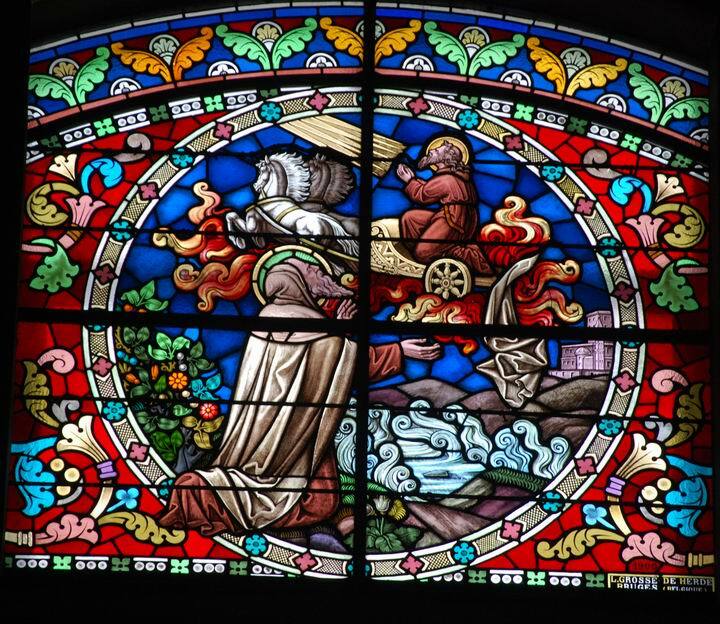 A detail of a glass window on the north side shows the scene from 2 Kings 2, depicting the departure of Elijah on a chariot of fire, while Elisha is observing from the Jordan river and picking up his mantle. 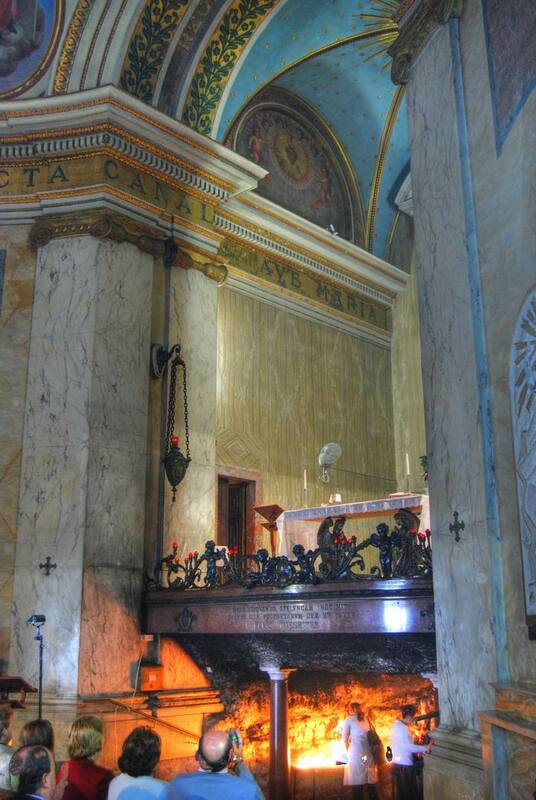 On the east side is a small cave where, according to Carmelite tradition, Elijah has stayed. The inscription reads: "Hanc aliquando speluncam incoluit Maguns illa Prophetarum Dux et Pater Elias Thesbites", which is in Latin for "in this cave stayed occasionally the great leader and father of the prophets - Elijah the Tishbite". The small cave is about 3M by 5M. On the floor before the cave are three markers that commemorate the founders of the Cramelite order - Berthold, St. Brocardus and Prosper. 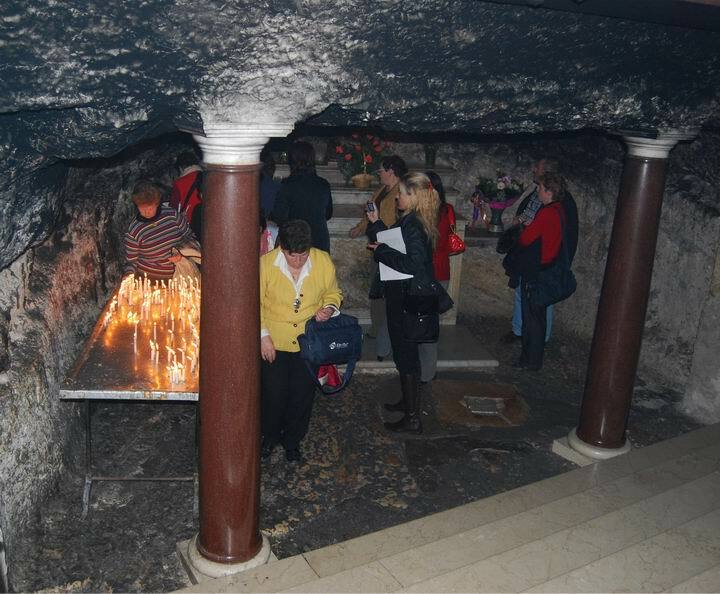 Inside the cave, behind the pair of marble columns, is a table where dozens of candles light up, and a stone altar is in the center. On top of the marble table is a statue of Elijah. According to tradition, the stone was the bedrock on which Elijah has slept. According to a late Jewish tradition, this is the cave and tomb of Elisha, Elijah's follower and prophet, who also resided in the Carmel (2 Kings 2: 25"And he went from thence to mount Carmel..."). Another tradition locates his tomb in Samaria, the capital of the Northern Israelite Kingdom. 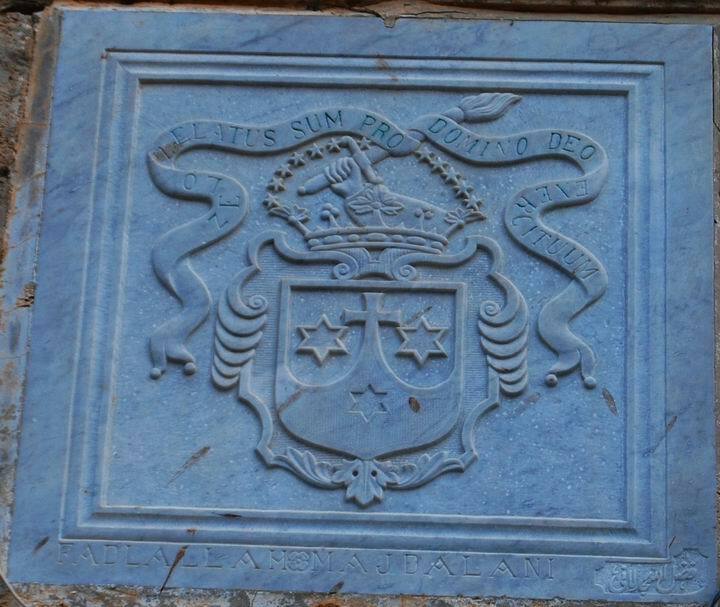 A small pyramid-shaped memorial stone, with an iron cross on top of it, reads a Biblical text in Latin: (2 Samuel 1: 27) "How are the mighty fallen, and the weapons of war perished!". It was erected in memory of the 200 French soldiers that were butchered here in 1799 by the Ottomans. Their bones were later collected (1804) and buried in the garden (1827), under the stone. Another memorial stone stands behind it. This iron cross has a small round base, as seen on the photo on the right, with an inscription. It is dedicated to the "memory of the brave soldiers who died on the Chateau-Renaud ship" during the French naval assault on Acre. The memorial was damaged in WWI by the Turks, an ugly incident that caused a public outrage. This led to the arrival of French vessels to the bay of Haifa, which bombarded the German consulate and German factory in Haifa. This text describes the departure of Elijah, which is illustrated on the paintings and frescos in the church. "And it came to pass, when the LORD would take up Elijah into heaven by a whirlwind, that Elijah went with Elisha from Gilgal ...and they two stood by Jordan. And Elijah took his mantle, and wrapped it together, and smote the waters, and they were divided hither and thither, so that they two went over on dry ground. And it came to pass, when they were gone over, that Elijah said unto Elisha, Ask what I shall do for thee, before I be taken away from thee. And Elisha said, I pray thee, let a double portion of thy spirit be upon me. And he said, Thou hast asked a hard thing: nevertheless, if thou see me when I am taken from thee, it shall be so unto thee; but if not, it shall not be so. And it came to pass, as they still went on, and talked, that, behold, there appeared a chariot of fire, and horses of fire, and parted them both asunder; and Elijah went up by a whirlwind into heaven. And Elisha saw it, and he cried, My father, my father, the chariot of Israel, and the horsemen thereof. And he saw him no more: and he took hold of his own clothes, and rent them in two pieces. He took up also the mantle of Elijah that fell from him, and went back, and stood by the bank of Jordan; And he took the mantle of Elijah that fell from him, and smote the waters, and said, Where is the LORD God of Elijah? and when he also had smitten the waters, they parted hither and thither: and Elisha went over". Laurence Oliphant "Haifa, or Life in Modern Palestine"
His article was published on July 31, 1883 with the title "St. Elias festivals and Carmelite Monastery", where he tells his readers about his visit to the site. He describes the festivals held at this place on July 20, with 6,000 visitors. Laurence describes how the statue of virgin Mary ("Notre Dam of the Carmel"), holding infant Jesus, was commissioned and how its golden crowns were added later. On both sides of the statue were two altars, dedicated to Simon Stock (from the 13th C) and Jean Baptist (from the 19th C). 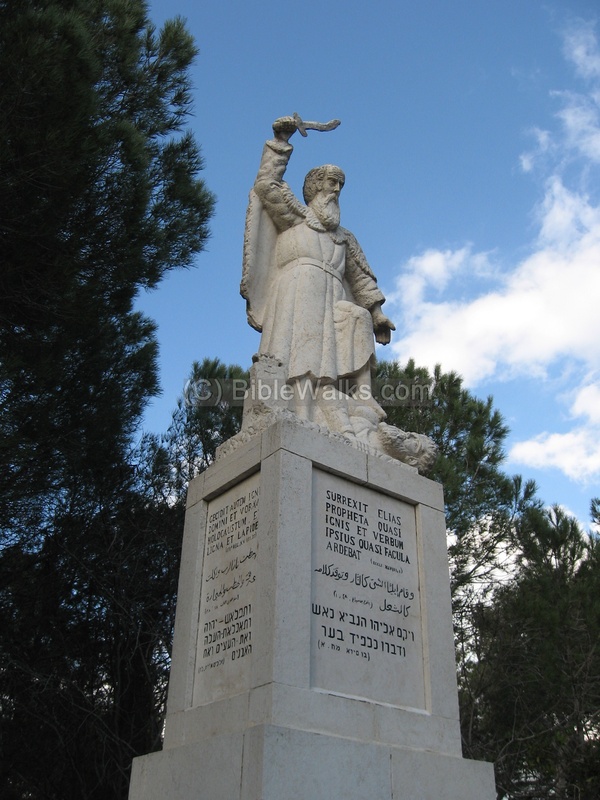 Near them is a statue of Elijah slaughtering one of the false prophets. He continues to tell the story of the monastery and its important influence on the life of the newly discovered Holy Land. It is a recommended book for the period of rediscovering the Holy Land. Elijah - The prophet. In Hebrew: Eliyahu. Means in Hebrew: Eli (my God) + Yahu (the Lord, the Hebrew God). Thus the name means "The Lord is my God". Elijah came from a place called Tishbi, in the region of Gilad - east to the Jordan river. Biblical reference: 1 Kings 17:1: "And Elijah the Tishbite, who was of the inhabitants of Gilead, said unto Ahab, As the LORD God of Israel liveth, before whom I stand, there shall not be dew nor rain these years, but according to my word". The Bible does not explicitly tells us that Elijah resided in the Carmel. However, the Bible describes the event of the contest with the false prophets (1 Kings 18:42): "...And Elijah went up to the top of Carmel; and he cast himself down upon the earth, and put his face between his knees"